Albion College’s Union Board hosted its third annual musical event, The Sing-Off. The event was held on Saturday, March 22 and played host to six competing teams: Euphonics and Bella Voce from Albion College, State of Fifths and Capital Green from Michigan State University, No Strings Attached from Western Michigan University and the victors, Fish N’ Chips, from Central Michigan University. Bailey Judson, Traverse City junior and a leader on Union Board, organized The Sing-Off with the help of fellow Union Board member Kaitlin Zinkel, Birmingham first-year. Judson had prior experience, heading the event the previous year as well. “The Sing-Off was one of the first Union Board events I helped put together, and I have been lucky enough to help it grow. The idea was based off the NBC Network show, The Sing-Off, and we [Union Board] thought that since our a capella groups on campus have such a big following, the campus would enjoy hearing groups from other campuses,” Judson said. The Sing-Off is a musical competition for a capella groups with a first place cash prize of $200. The groups competed in front of three judges: Albion College’s Registrar Drew Dunham, Elinor Marsh from Annual Giving & Alumni Engagement, and Greek director Jon Collier. The teams were judged on musicality, originality and stage presence. There was also a fan-favorite portion of the event, in which the audience indicated which group they thought performed the best through applause. The group with the most applause received an extra six points tallied to their final score. 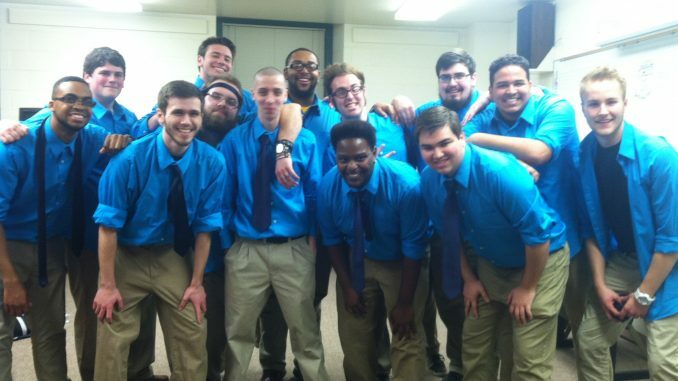 In the final scoring, all-male group, Fish N’ Chips snagged first place, with Capital Green coming in second, and Albion College’s own Euphonics taking third. Chris Blaker, Farmington senior and head of Euphonics felt prepared and hopeful going into the competition. Coming from Central Michigan University, this was Fish N’ Chips first competition, and they were the winners of the audience vote. When asked how he felt about the big win, Fish N’ Chips representative, Kenny Davis, Northville junior, was thrilled. “It’s our first competition we’ve ever done. Our group doesn’t really have much experience with competing. A lot of our friends’ groups were here, and we just came out, decided to give it our all and see what we could do, and we ended up winning which was huge,” Davis said. Kylie is a first-year from Brown City, Michigan. She is a double-major in Professional Communication & Production and English, with a focus on Broadcast Journalism.